Never fumble for your keys to unlock your door again! 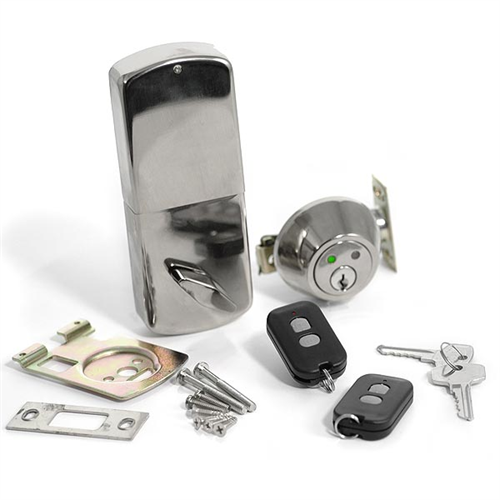 This 2-in-1 deadbolt installs like a normal deadbolt and allows access by the included RF keyfob or using a regular key. The keypad can be temporarily lit to make it easy to use in the dark. This convenient lock is similar to those found in high-security applications in office buildings and institutional facilities yet can be easily installed at home by anyone who knows how to use a screwdriver. The lock uses 4 AA batteries (sold separately). If you add an Insteon Morning Industry Lock Control Kit you can lock or unlock using automation software, Internet control and more!